There was a time when Chop Suey was synonymous with Chinese food and neon lit movie theater-style signs across the nation proudly proclaimed this exotic eastern specialty to passersby. In reality the dish we all know as Chop Suey is most likely an adaptation of a similar dish from the Guangdong Province, brought to the US by Chinese laborers over 150 years ago. Like any group of migrants they craved foods from their homeland, but without access to the same ingredients, they made do with the ingredients that were locally available at the time. By the time I was born, Chop Suey had faded into a culinary relic, and yet my hometown featured its very own vertical neon CHOP SUEY sign, jutting out from the side of a building on Main Street. 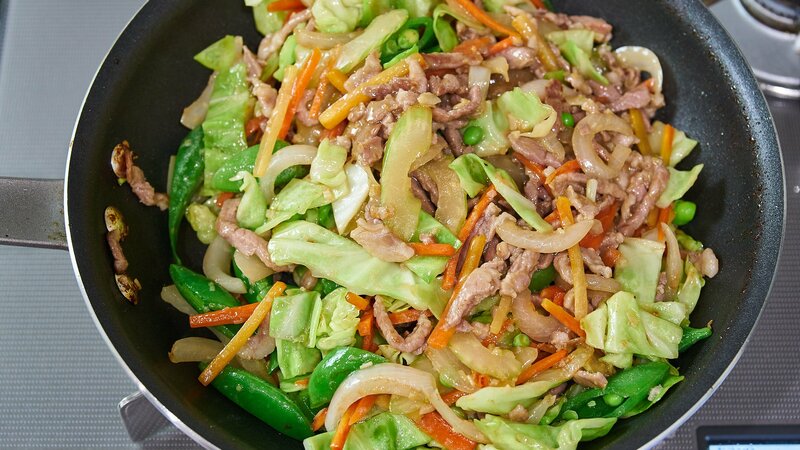 At it’s core, Chop Suey is a quick stir-fry of a little meat and a lot of vegetables with a savory sauce that’s just thick enough to coat everything with flavor. Sounds pretty good huh? So how did this one time standard bearer fall from being the face of Chinese cuisine in the US to become a culinary abomination? This may have been due in part to culinary fatigue, but I suspect that as Chinese-American cuisine evolved to include more proteins, restaurants prefered pushing patrons towards more protein heavy dishes that they could charge more for. Yet another reason is that a great vegetable stir-fry like Chop Suey can be hard to execute, especially in a kitchen where most of the items are deep fried and sauced. I can’t think of anyone who enjoys a plate of soggy vegetables in a cloying sauce. So what are the secrets to making the Best Chop Suey? Be prepared – as with any stir-fry the dish, Chop Suey cooks very quickly, which is why it’s essential to have all the components prepared and ready to go into the pan. Marinate the pork – by marinating the meat and adding a bit of starch to the mix, you not only ensure that the meat is flavorful, the starch helps lock in the meat’s juices, preventing it from drying out. 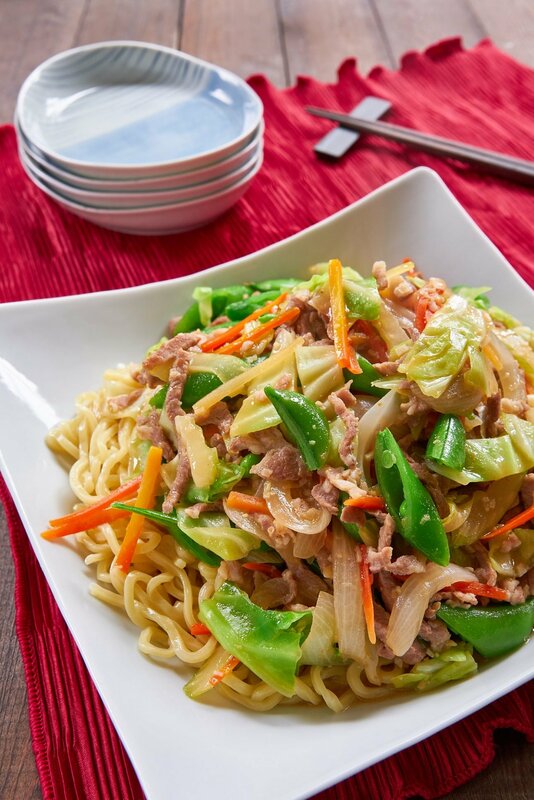 Add ingredients in order – by adding the ingredients to your Chop Suey by the length of time they take to cook, you avoid the problem of under/overcooked ingredients. 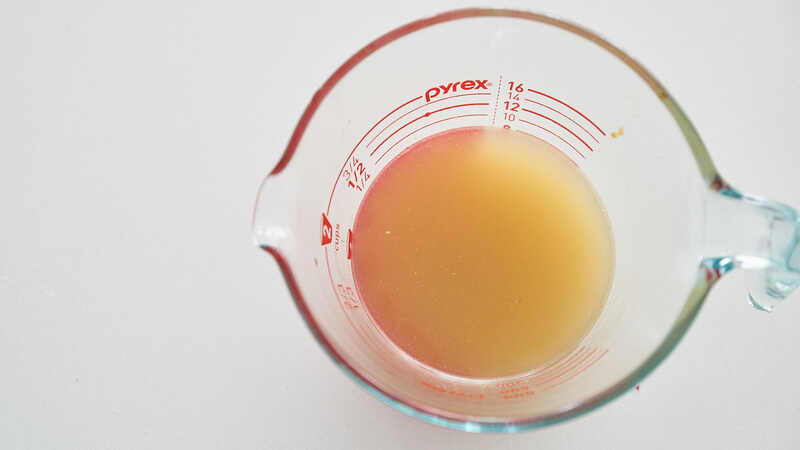 Use potato starch – I prefer potato starch to corn starch for thickening sauces because it thickens without clouding the sauce, and it does not get gummy, even after it cools. Bob’s Red Mill is the most common brand in the US. If you follow these basic rules, you’re all but guaranteed to be sitting down to delightfully easy and delicious Chop Suey that comes together in about 15 minutes. The type of vegetables you add, and whether you serve it over rice or noodles is entirely up to your tastes and what you have in the fridge. Bring a large pot of salted water to a boil for the noodles. If you prefer serving this over rice, you can make rice instead. 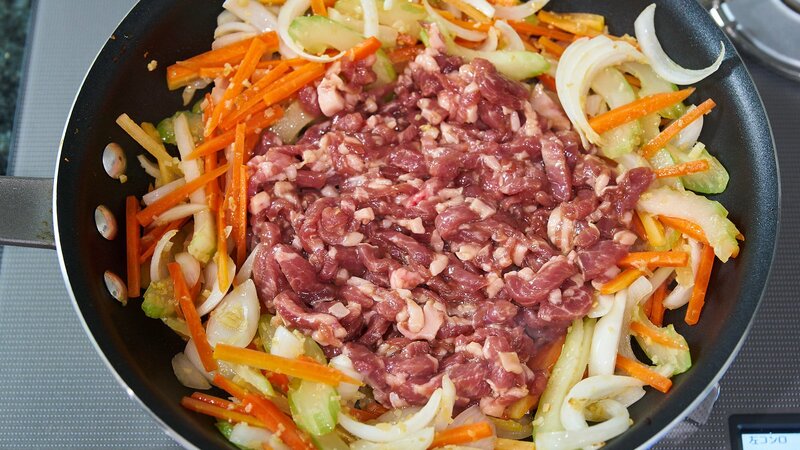 To marinate the pork, add the pork, Shaoxing, oyster sauce, and potato starch to a bowl and stir well to combine. To prepare the sauce, add the chicken stock, oyster sauce, potato starch, and white pepper to a bowl and stir to combine. When your vegetables are all chopped and ready, start boiling the noodles and heat a large frying pan or wok over high heat. 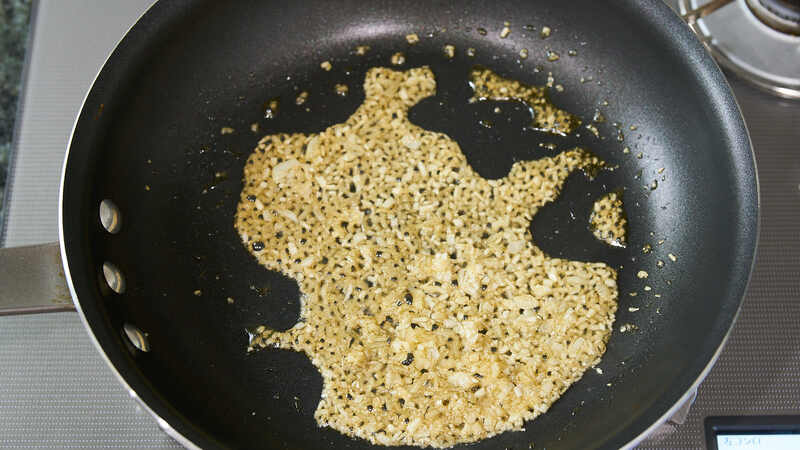 Add 1 tablespoon of sesame oil to the pan along with the garlic and ginger, and fry until fragrant (20-30 seconds). 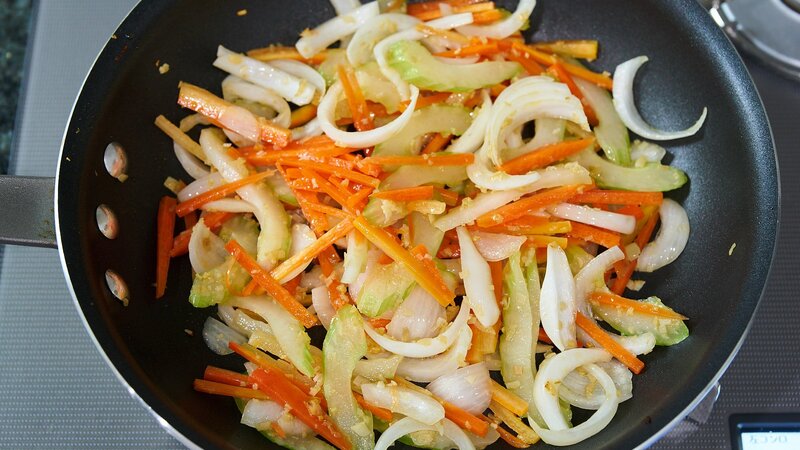 Add the the celery, onion and carrots and stir-fry until the onions start to become translucent. Make some space in the center of the pan and add the marinated pork. Press the pork out into a flat layer and let it brown a bit before stir-frying. 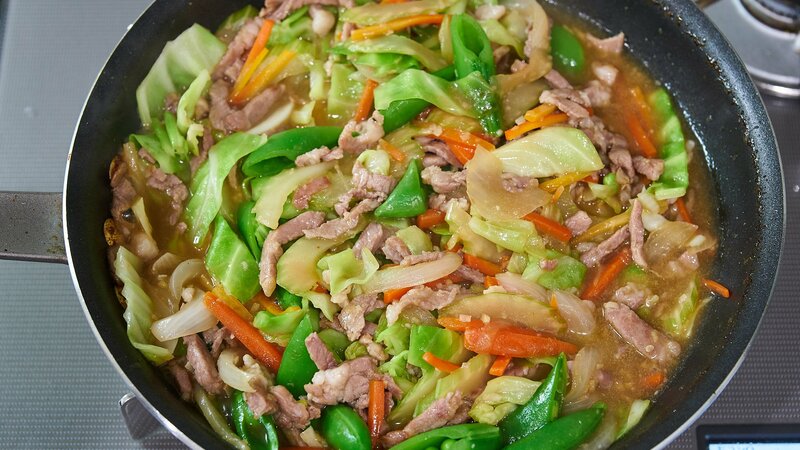 When the pork is mostly cooked, add the cabbage and snap peas and stir-fry until the snap-peas are bright green. Drain the noodles when they're cooked and toss with a bit of sesame oil to keep them from sticking together. Give the sauce a stir and then add it to the pan. Boil the mixture until the sauce thickens. Adjust salt and pepper to taste. Serve the Chop Suey over the noodles with the sauce. And do you really Use toasted Sesamöl oil for stir fry ? Doesn ´t it geht bitter? Hi Rob, Oyster sauce has much more flavor than soy sauce which is why it’s often used in Chinese stir-fries. As for the sesame oil, as long as you’re toasted sesame oil is properly filtered (i.e. it’s not cloudy) you shouldn’t have problems with it getting bitter. If you’re worried about it you can swap it out for a more neutral oil, but I wouldn’t have posted this if I didn’t think it was good. 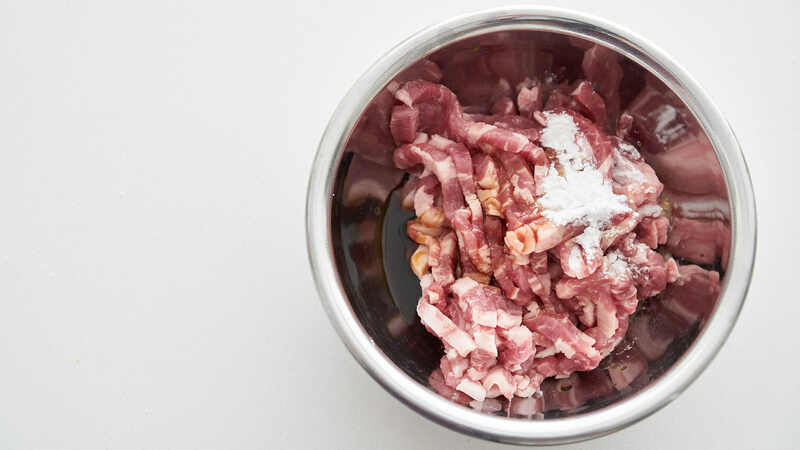 Hi Lemmonee, because the pork is sliced into small pieces, there’s no marination time, you just keep moving once you’ve soaked it in the marinade. Marc thank you so much what a treat this was. With the preparation it is easy and ready in no time. I cook for myself and parents, I double the sauce amount. We enjoyed the lighter sauce that let the veg and pork shine. I used sake that we had and will try the Shaoxing wine next time. Rice was perfect. I purchased some potato starch it is worth the effort to find the sauce was really nice. We all loved the crunchy vegetables and that’s what chop suey is all about. I’m so glad to hear you enjoyed this. Thanks for stopping back by to let me know. Potato starch is great isn’t it? It’s also great as a coating when frying things (like karaage) as it forms a nice crispy crust. I don’t use cornstarch for anything anymore, as the only benefit it has over potato starch is a lower gelling temperature, but when I need something to set at a low temperature like a custard, I use tapioca starch.